Beets, these ruby red root vegetables provide so much nutritional benefits! Who doesn’t love the deep red color that beets provide. Here are 6 nutritional benefits of beets! Betcyanin is a type of pigment that ranges from dark red to purple. Betacyanin is being studied for it’s anticancer and tumor fighting effects. It’s also a powerful antioxidant that increases the bodies immunity against different aliments. Beet juice is a great way to build immunity. Betaine is being studied from its ability to lower homocysteine levels. Homocysteine is linked to heart disease. Beet juice and beets have soluble fiber. This is my favorite type of fiber because soluble fiber delays the emptying of your stomach which could help control weight gain. Soluble fiber also is capable of lowering LDL (bad) cholesterol. Beets are packed with folate (provides 34% of the Daily Value) (Barone et. al, 2002). Folate is important for pregnant women, since it may prevent birth defects and promote brain development of unborn babies. Folate may also protects us against heart disease and cancer. 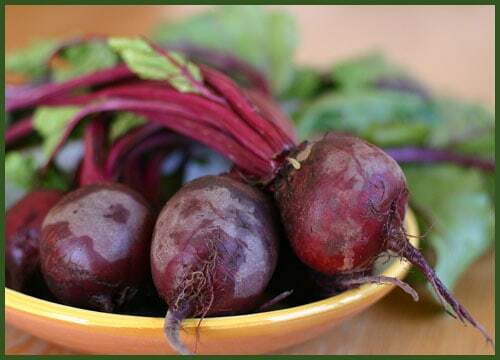 Beets may also prevent anemia since it can foster red blood cells due to it’s components iron and folic acid. It’s also a natural blood purifier since it works to push toxins out of the blood. Due to it’s alkaline elements beets are a natural antacid. Beets are a natural laxative and prevent constipation. Beets are packed with nitrates. Many clinical studies have found that supplementing your diet with 2 cups of beet juice per day actually lowers your blood pressure. Besides lowering your blood pressure the nitrates found in beets enhance athletic performance by reducing your body’s need for oxygen during a workout. 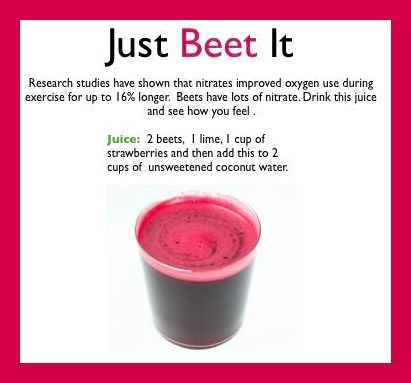 Drinking 2 cups of beet juice before a workout is safer and healthier than taking caffeine and workout supplements. Workout supplements often have nitrite which is toxic at high levels. People who are prone to kidney stones or gout should avoid beet greens and spinach since they have high amount of oxalates. If you are any medication or have any medical condition such as diabetes always consult with your doctor before starting any new protocol. Some people can’t properly metabolize the pigments in beets and thus their urine turns bright red. Don’t worry this is harmless. You can also juice the green top. It’s packed with nutrients as well.